If you are looking for the best deal on the Ultra Wheels 195 CRUSHER Black Machined 20x10 wheels, All Star Motorsports is the place for you! 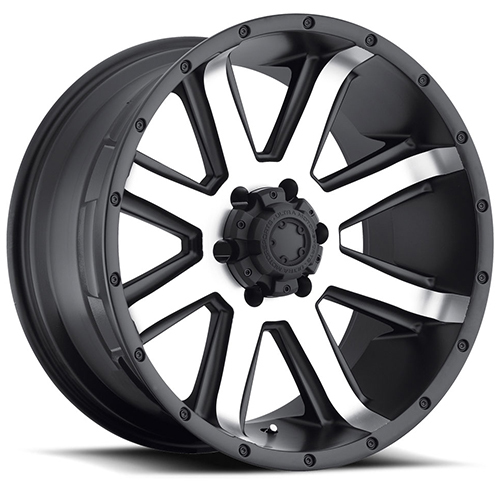 We carry the Ultra Wheels 195 CRUSHER Black Machined 20x10 wheels in many different sizes and finishes and we have the best prices around. These wheels are made with the finest quality alloy and are built to suit your vehicles needs and exceed your expectations. Here at All Star Motorsports, every wheel is individually inspected and professionally packaged to ensure that the wheels get to your location damage free. All wheels are shipped free to your door within the continental U.S. and we even throw in a set of lug nuts at no cost. We also have a wide selection of tires to choose from. Include tires with the purchase of these wheels and make it an All Star Package deal. Included in all packages are FREE mounting and balancing to ensure the best possible ride. At All Star Motorsports, we pride ourselves in providing our customers the very best products and customer service in the business. We strive to get you the best deal we can and as always, we guarantee the fitment. Don't know if the wheels will fit your vehicle? Give us a call and let our 49 years of experience work for you. Our fitment experts will help you find the best fitment possible for your vehicles needs. So give us a call today and have an All Star at your side!